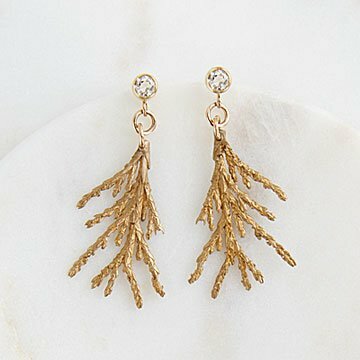 Cast cedar sprigs complement sparkling studs of white topaz. In the Appalachians, rolling green ridges extend to the horizon. Despite the grandeur of this big picture, Nancy Nelson is focused on nature's fine detail, like the delicately repeating pattern of cedar branches. She gathers small cedar sprigs that she hand casts in brass using the lost wax technique. Suspended from a stud of sparkling white topaz, they're organically elegant pieces that pair well with any outfit that could use some woodsy sparkle. Handmade in Maryland. I loved these in the pictures but when I received them I wasn't impressed with the quality. I showed them to my 30 year old daughter and she agree they were not up to snuff. They are being returned.